Why do we go to parades? As kids we only went for the goofy clowns and the candy they gave us, but why do we still go as adults? Is it just for the kids? I’m starting to wonder…. As I sat and watched our big Oktoberfest parade this weekend, I found myself bored, uninspired, and totally unexcited – not a great combo for me! 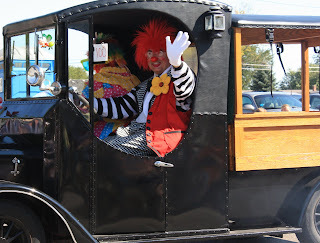 As I sat there impatiently waiting for the clowns and their candy, I found myself wondering when someone decided that simply driving a car down the street qualified for entertaining parade material. At least spruce up the ride a bit and try driving the car with your feet. My best friend and I did that a few times down side streets in high school and it made for great entertainment! Parades are just no fun anymore! From the expressionless faces of the people lining the streets, you would think we had gathered to watch a funeral procession. There were only a few clowns throwing candy at the kids – which is fine – but now there’s people handing advertising material to us adults. How did those crazy telemarketers find me on this street corner? I tried to avoid making eye contact with them so they wouldn’t give me their loot, but they just went ahead and dropped it in my lap anyway! There were a few lively acts during the parade and I noticed the energy level of the crowd escalated quite a bit during those moments. It started me thinking about the obvious need for Parade Route Reform. I’m afraid the ritual of parades will disappear by the end of the century without some serious change. It’s only going to be a matter of time before thousands of people refuse to sit on a curb just in hopes of getting a few free Tootsie Rolls from some clowns. Parades should be entertaining! I think parades should be like a walking Circus. If you want to drive a tractor in the parade, do some wheelies with it. If you want to ride your horse in the parade, let’s see it race or jump a Shriner in one of those mini-cars. And I want to see a clown do some clown tricks – maybe some juggling or back flips. If schools want to march their band in the parade, choose a song with some pizzaz! Wouldn’t it be great if their music got everybody jumping up off the curb and dancing like fools? Now, that would be a parade! I’ve got a vision, I just don’t know who to talk to about it. With everything going on in the country today, Parade Reform would probably fall a couple hundred notches below the Economic Bail Out Plan on the nation’s “To Do List“, but if something doesn’t change soon, I’m afraid parades could be a thing of the past……. Good luck with your Parade Reform. I'll happily be a supporter!! reading this, i can't help but think of the parade scene in "Ferris Bueller's Day Off" where he's surrounded by the German beer wenches, singing and dancing on the float :) never seen a parade quite like that in real life, though. just a bunch of crusty politicians and too many parents w/ kids in wagons. bORing! You are so right - I think it is to much TV - people are "underwhelmed" - they're not spectacular enough - fireworks are even getting to be so normal - we have them here in Myrtle Beach all summer - and I love fireworks!